Comforting, nourishing and inexpensive, the origin of home-cooked soul food lies in early African American cooking traditions that made use of food items others tended to discard. Dishes like baked turkey wings were transformed from throw-away status to savory meals, supplemented by vegetables grown in the yard, fruit and game gathered from the wild and plenty of seasoning. Make your own contemporary version of soul food with turkey wings, which these days, may appropriately be found in the grocery store, at farmers markets or at your local butcher shop. Pull out and discard any small pinfeathers that may still be attached to the turkey wings. Rinse the wings under cool water, pat them dry with a paper towel and lay them out in a single layer on a large plate. Mix together a combination of 1 to 2 tbsp. of seasoning salt and 1 to 2 tsp. of garlic powder. Poultry seasoning, dried thyme, fresh-ground black pepper and regular table salt may be included in your seasoning mixture in volumes ranging from a pinch to a full teaspoon each, to suit your taste preferences. Sprinkle the seasoning mix lightly over the turkey wings, allowing about 1/4 to 1/2 tsp. per wing. Turn the wings over and sprinkle to other side with a similar amount of seasoning. Coat a large glass baking pan with non-stick cooking spray. Arrange the seasoned turkey wings in a single layer in the pan. Place about a tablespoon of water per wing in the bottom of the pan. Melt 3 to 4 tbsp. of butter in the microwave. Stir 2 to 3 tbsp. of lemon juice into the butter. Drizzle half of the mixture over the wings, setting the remainder aside until later. Cover the pan with aluminum foil and place it in the oven. Bake turkey wings for 2 hours at 250 to 275 degrees Fahrenheit. Remove the pan from the oven and take the foil off the top. Drizzle the remaining butter and lemon juice mixture over the turkey wings. Return the pan to the oven, uncovered. Turn the heat up to 350 degrees. Bake the wings for 15 to 20 minutes or until they are a deep golden brown. 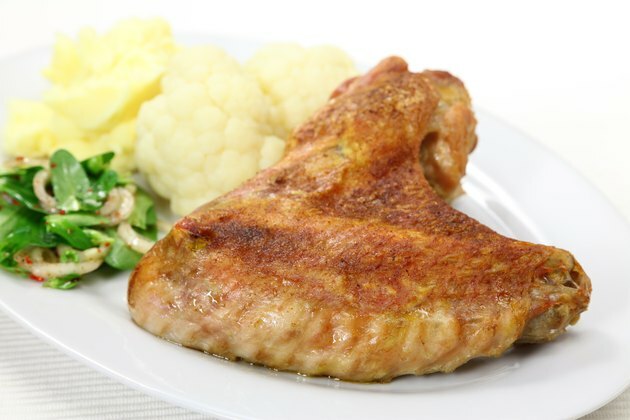 If you are on a sodium-restricted diet, use salt substitute combined with dried herbs and ground pepper to season the turkey wings. Thaw frozen turkey wings thoroughly in the refrigerator before baking. Reduce the amount of seasoning and butter, and add one or two sliced onions and a can of reduced-fat chicken broth to make a light, sauced version of baked turkey wings. Wash your hands with hot, soapy water, as well as any utensils and surfaces that come in contact with raw turkey, to prevent contamination by foodborne organisms.